It was wonderful weekend but I did not cook much, I am still in the process of screwing and fixing things in our new Place. So I thought of posting yummy and flavorful dish which was lying in my draft for so long. " Vegetarian Chili " which has wonderful flavor that runs around in a single pot. There are several ways you can have this chili, please scroll down to know more about the serving suggestions. Before we go for the recipe and virtual treat. Here is a brief about Vegetarian Chili. If you don't have this just soak 1 1/2 cup of soy granules in hot water for few minutes then drain and squeeze out the excess water, now its ready for making the dish. 1. Heat oil in the deep pan. Add the bay leaf, followed by crushed garlic and chopped onion. 2. Saute and then add the Squash, Mushroom and Peppers, drained and squeezed soy granules or the readily cooked meatless ground. 3. Just saute for a while and then add corn and beans. Now add the seasonings cummin, Chilli powder, Paprika, Herbs seasoning. 4. Add the Tomato diced in the can followed by the vegetable stock and 1 glass of water. 5.Now in this stage the consistency will be lose, simmer the flame and this has to sit for at least half an hour. 6.This simmering is very very important, the flavors are nicely absorbed or incorporated in the soy protein, veggies and the bean. 7. Once the water and stock are absorbed but not full. The consistency has to be semi solid. 8.Put of the flame, serve in the bowl with a dollop of sour cream or cheese with fresh cilantro. 1. You can serve this hot chili in bowl with sour cream and cilantro. Along with Tortilla chips and Guacamole. 2. You can use this for filling the Tacos. 3. Filling for hot dog buns, slit the bun add some chilli and cheese broil until the cheese melts. 4. Use as filling for sandwich. 5. Topping for Pizza and top it with cheese and bake until cheese melts. Warm the tacos in the oven, add the chili followed by other ingredients and enjoy !!! This is other version II. Here is another version of GUACAMOLE in my mexican feast. Mix all the above ingredients and serve as dip or filling. Love the vegetarian chili with a fantastic twist. Awesome and crisp tacos. The veggie chili sounds wonderful, healthy and warming! as usual lovely presentation!! Awesome.. 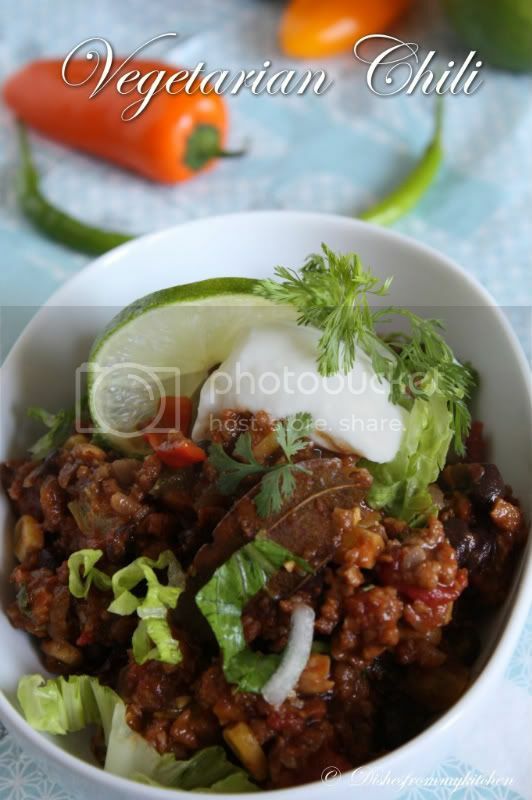 Sounds yummy.. Pics are great..
Veggie chilli looks comforting and delicious.Beautiful clicks,love those peppers. Hi dear Sayantani thanks for your lovely compliment. Hey those chillies are not grown in my garden but wish to have soon :) , I took those chilli picture when i went to fair offcourse I am chilli lover and wonder how many varieties of chillies in the world, I really admire its shape, color and spiciness(hot) it has. Wow this is so healthy and delicious.. Thanks for sharing this wonderful veg chili recipe. Love the clicks...nice and easy recipe!! 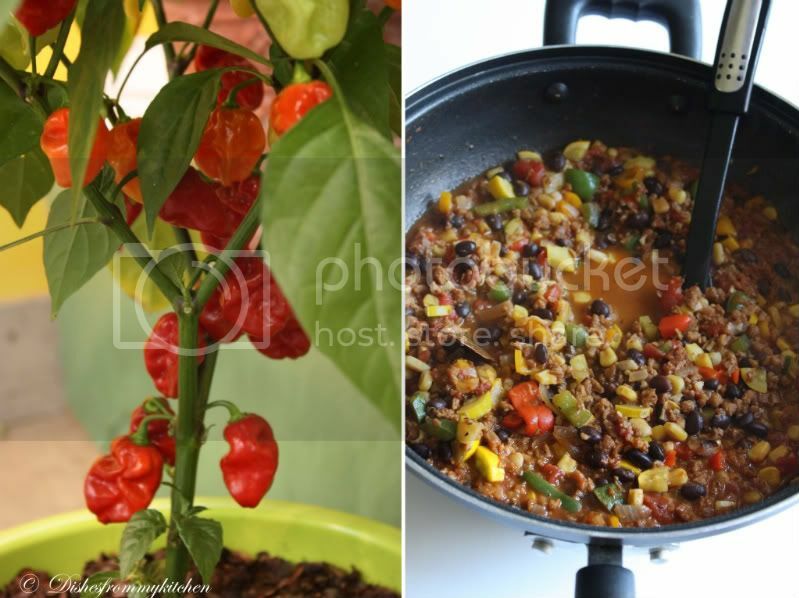 Awesome clicks and super yummy chilli recipe. 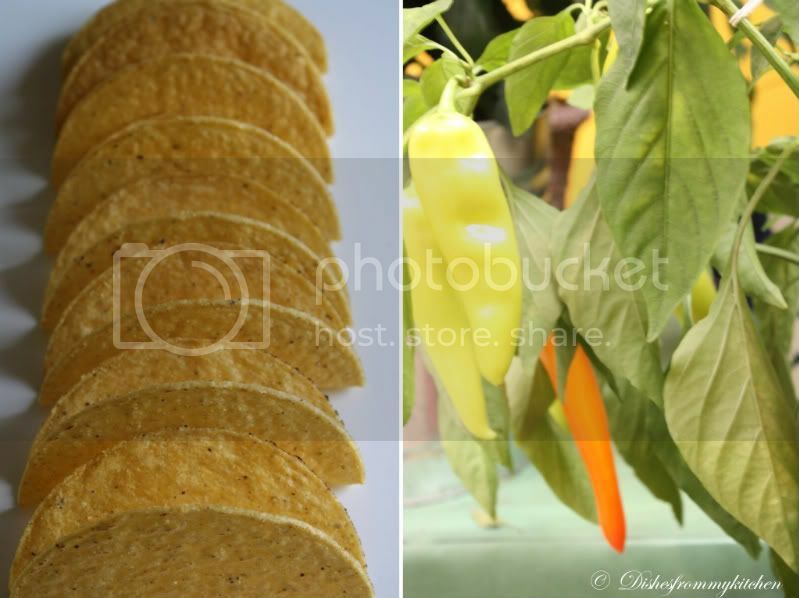 Me too love olives in tacos, great post!! 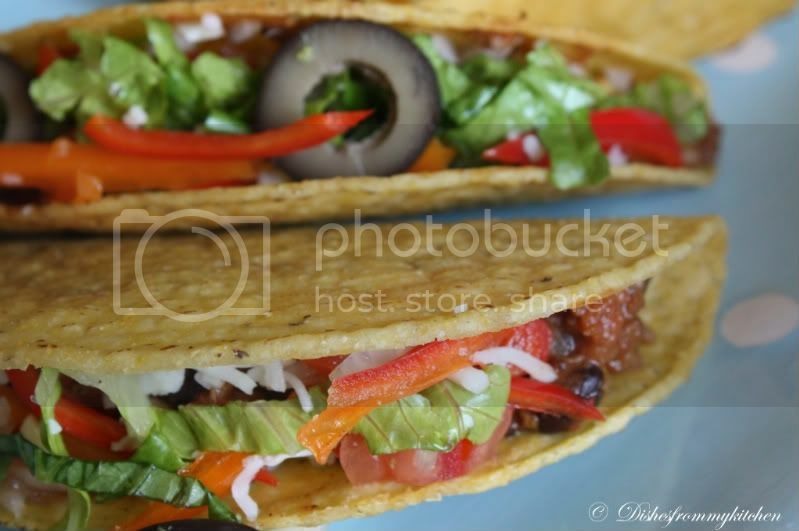 healthy n delicious chili... tacos look colorful n great.. The photos look very awesome. I am sure the chili must have tasted yummy too. amazing! Very yummy and healthy! The recipe sounds awesome Pavi,never tasted this vegetarian chilli so far and also yet to try the tacos,they looks very cute and tempting! Awesome chili Pavi, am gonna shift my home next to urs..beautiful dish..
A vegetarian chili is certainly welcome, having seen and read about the non-veg versions. Am not much of a soya person, chili with the other options u suggest would be a nourishing one-pot gourmet dish!! Aiyyo Pavi - I'm so back in the line today! This indeed is a virtual treat like you say! Love it. TH has been asking me to make Vegetarian Chili for a while now - and I've been procrastinating! Maybe now I'll really get serious about it - considering how pretty you've made it look! Love the post! Awesome!! i was looking for this recipe for so long..this is going on my "must make" list..:) Love your recipe..thanks for sharing Pavi! 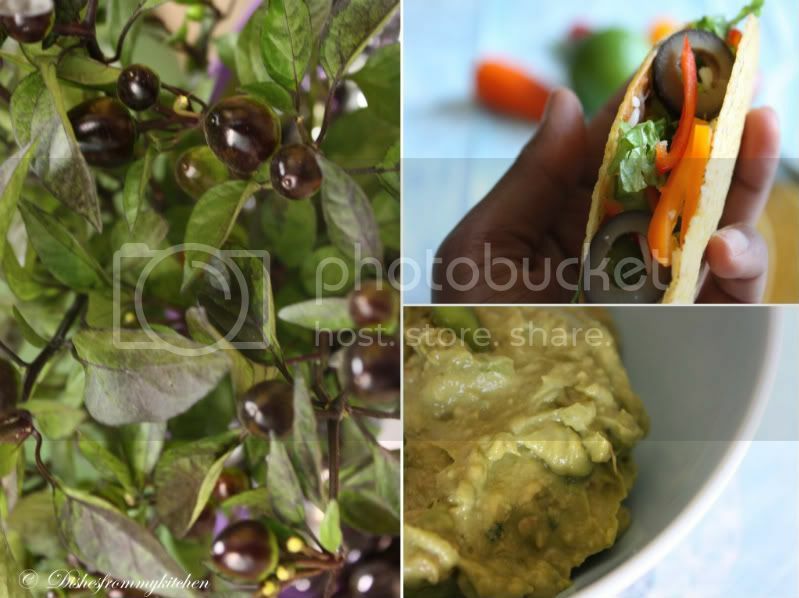 Tempting pictures, Pavithra..and superb recipe!! Hope you settle down soon.. I am totally tempted with this vegetarian treat. Looks irresistible! 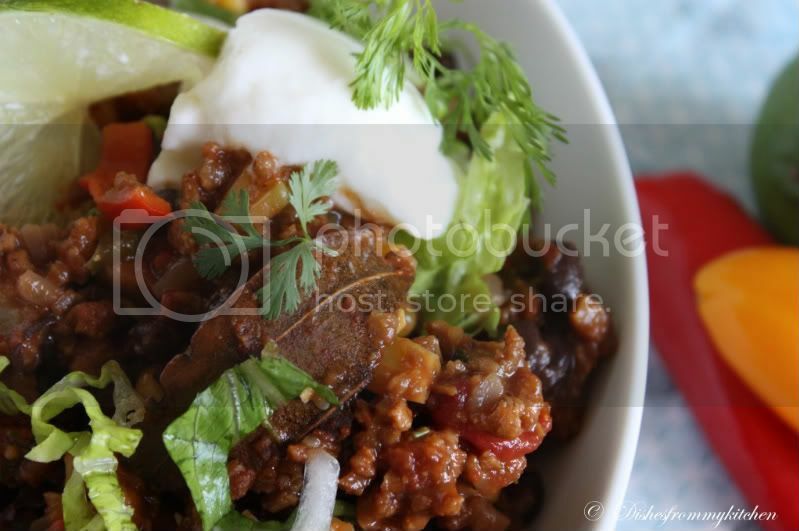 This vegetarian Chilli looks wonderful and delicious! all the snaps are just fantastic!! 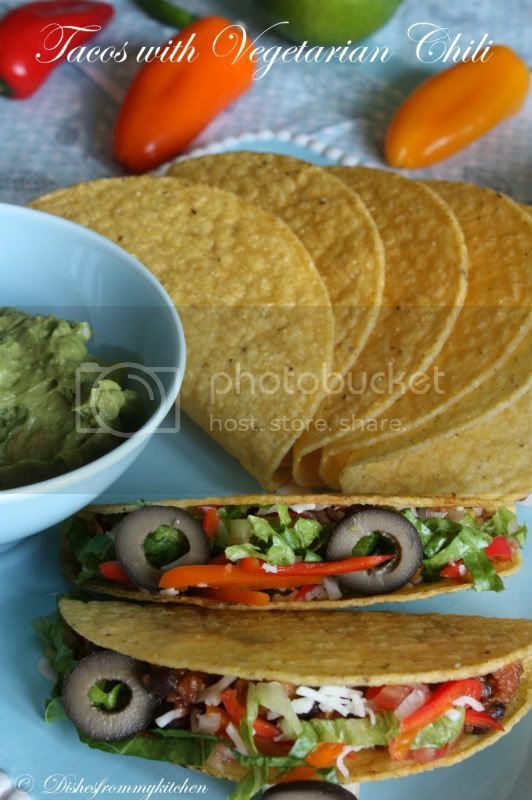 Lovely presentation of taco's and Vegetarian chilli looks tasty n healthy.I m too a big fan of Guacamole but I make it more with Indian spices n lot of chopped green chilli. 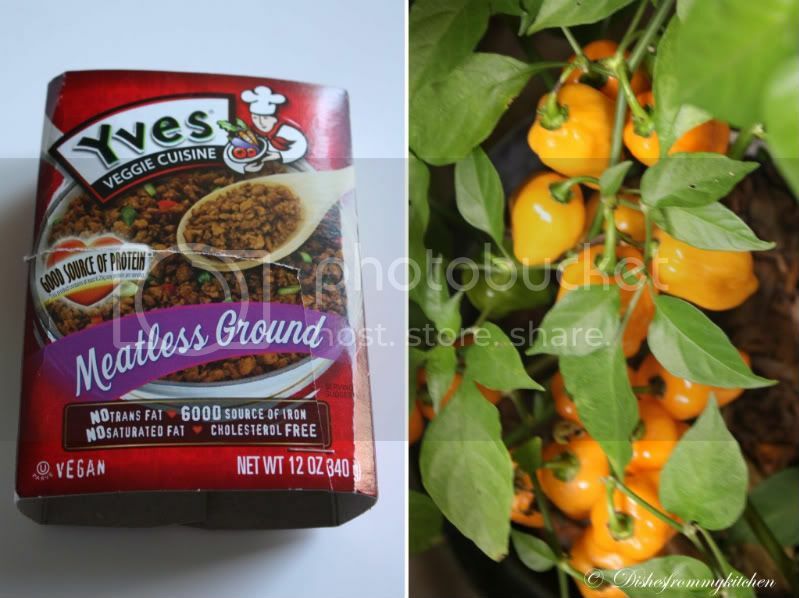 My mom makes 'meatless' chili using Yves meatless ground too. But I love how thick and hearty yours looks! Great recipe Pavithra. I am a sucker for anything healthy and vegetarian, so this is perfect! Your pics are beautiful! Thanks too for stopping by my blog and welcome! 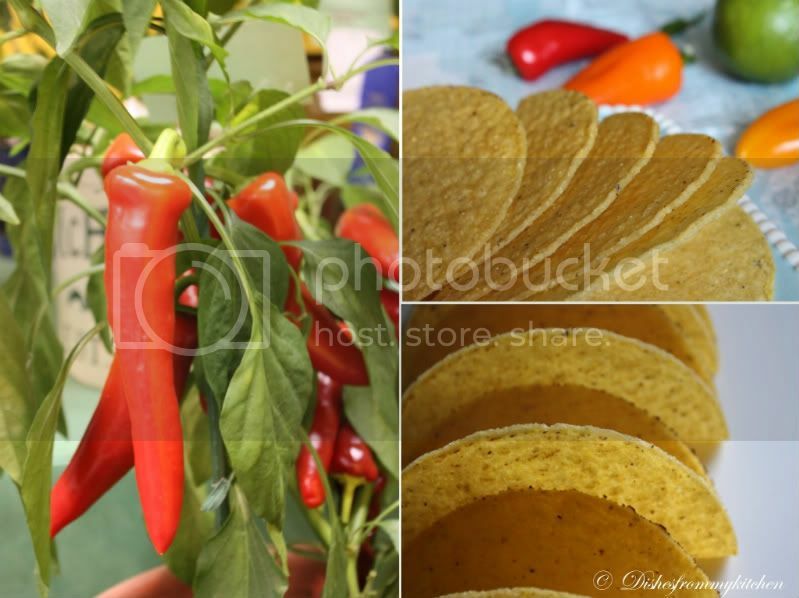 Liked the twist on the chilli..awesom clicks...all dishes look & sound yummy!